Škofia Loka – the start (and end) of our route. Looking out of the aeroplane window at the landscape below, I thought of everything I had heard about this beautiful country. I already had high hopes, and it seemed Slovenia was not going to disappoint. Luscious green meadows gave way to undulating hills and soaring peaks. Pressing my nose against the window for a closer inspection, I could see the mountains looked steep. I was excited and nervous for the two weeks ahead. Taking inspiration and guidance from Bikepacking.com, I had meticulously planned a 500-mile route on ViewRanger – my go-to app for any adventure. It started just outside Ljubljana, climbed through the mountains, dropped down to the coast, then headed back into the hills before returning to the start in a pleasing loop. It was an ambitious first bikepack! Just as I was beginning to worry about having bitten off more than I could chew, the plane landed with a heavy thud, seamlessly transitioning my concern to the state of my bike… Carefully boxed and bandaged, I had lovingly handed my precious cargo over to a surly looking airport attendant, hoping and praying they would treat it with the care and affection it deserved..! The streets of Škofia Loka. Through security I was delighted to see my bike bag waiting for me – I was still unsure of its condition, but at least it had arrived! I would tackle unpacking and assembling once we got to our B&B in Škofia Loka (the start of our route). Now slightly tipsy, waylaying bike assembly and exploring Škofia Loka seemed like a much better idea. Not setting off until tomorrow we had all day, and the whole town seemed to be celebrating – medieval style! Škofia Loka Festival – a day dedicated to celebrating their town’s birth (and our arrival)! Maybe I should have tried this before!? Or at least fill my water bottle with Igor's medicine before we set off! 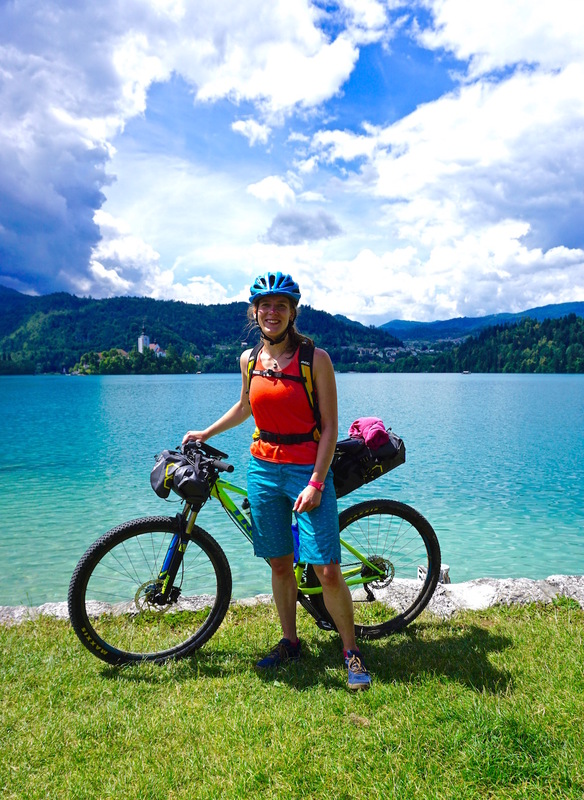 After an intense debate about whether or not we needed to bring the stove, I cycled out of Škofia Loka with 101 doubts, all based around packing choices (you can see my final packing list here). I had a feeling I would discover I had simultaneously packed both too much and too little! A woodland descent on route to Bled. As we meandered along I began to relax, despite the initial apprehension, things were going excellently – the view was stunning, the sun was shining, and we had lots of food. With a heavier bike, I was aware I was crawling along but felt very happy to adapt to a slower pace of life. Panting my way up the first climb, I realised another thing I was grateful for – the gearing on my hardtail. The gravel bike would have been an error with this much weight to carry. During my planning, I had mapped out various points I wanted to visit. The first of these was the confluence of the Sava Dolinka and Sava Bohinjka. Hot and sweaty, by the time we’d bushed-whacked the last 100m – I was ready for a swim. I stripped off and sashayed toward the water with the confidence of the woman in the Herbal Essences advert… Only to then emit a series of expletives. F*** it was cold! I hadn’t expected that – the sparkling aquamarine water looked so inviting. Composure reestablished, I went for my usual (less graceful) approach, got a grip and got in. After all, I needed a wash! The confluence of the Sava Dolinka and Sava Bohinjka. Back on the bikes, we continued through the hills and woodland until the view opened out to reveal the infamous Lake Bled. Lake Bled matches my shorts! Running on a combination of excitement and Bled’s finest ice cream, we felt we had just enough energy to cycle an additional 10 miles to go and see the Vintgar Gorge before coming back to jump in the almost unnaturally blue (but considerably warmer) water. I could do two weeks of this! Map reading's going well but knowing my left and right would help! After a near perfect start to our trip, I knew there would be some sort of minor calamity just around the corner… Sure enough, that night the heavens opened, and a massive thunderstorm hit Bled. Not only did this make a good night’s sleep impossible, but it also ensured everything got very wet packing up in the morning. Squelching out of the campsite, I was on the cusp of a ‘bad weather on holiday’ tantrum when I spotted a mobile bakery… Two pastries later I was a different woman – baked goods make everything better! I was ready to take on the mountains. Cloud’s disbanding, enjoying the flat. A cool bridge between Bled and Gozd Martuljek. This was lucky as Day 3 was all about the up! As the road climbs turned into forest tracks, the gradient gradually got steeper and steeper. Still pedalling (very slowly) I was content and vaguely surprised I was even moving forward. However, the occasional glance at the adjacent mountains showed me that there was still a long way to go. A few hours later we reached an alpine hut. It wasn’t open yet but looked very appealing and had a back room you could bivi in. Sun now shining, I lay in the meadow admiring the view. I could quite easily stop here for the night… It would mean cutting our day short and having an early finish which might be nice… But then again, the top seemed so close. Did I really want uphill for breakfast!? Or would it be better to get it out of the way now? Looking at my watch, it was only 3 pm. I picked up my bike. Turning away from our peaceful sanctuary, the forest track continued to wind upwards quickly going from ‘steep but rideable’ to ‘full on ridiculous even for a hiker’. As I’m sure you can imagine, pushing a loaded mountain bike up a rocky mountain path feels about as efficient as shifting a full shopping trolly without wheels. With the rain starting to fall again and the Haribo supply dwindling, Type 1 fun very quickly became Type 2. The start of the push, before the rain. After what felt like an eternity of effort later, I wasn’t far off losing my cool. It was still unrideable, still uphill, I was drenched, and my water was running out. I knew I should’ve filled up at the hut – I’d just thought there would be more streams and waterfalls higher too. Slowly savouring the last gummy bear, I contemplated our situation… This was remarkably hard work for an easy going, low-stress holiday! Luckily moments before the final sugar crash, the ridge appeared before us. At around 1,900m we’d made it to the top of our climb and the view instantly made the effort worthwhile. Weaving in and out of the trees along a rocky path we followed the mountains just beneath the ridge. The riding was technical and challenging, especially with an intimidating drop to our left – but rewarding. It turns out a change of pace was exactly what I’d needed. Even pushing and scooting the harder sections, I was having fun and back in my happy place. Stopping for a quick moment to admire the view. Swooping back into the trees to rejoin the wide logging tracks, our focus turned to finding water. To my relief, we quickly found a stream to fill up from. I was parched and tired – this meant we no longer had to make it back to civilisation that night. It was time to pitch the tent, cook dinner and sleep. What a day. Bikepacking and mountaineering have a lot more in common than I first thought! Next 10 things no one tells you about bikepacking!